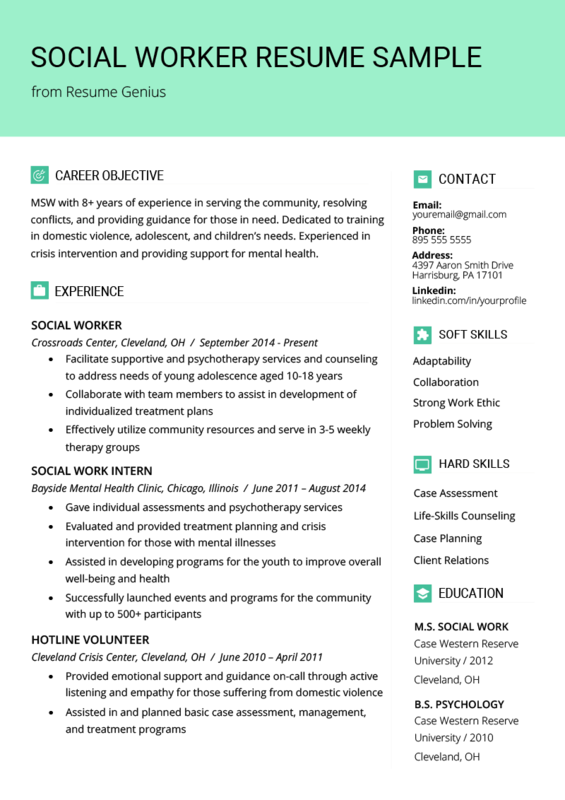 Download our FREE resume sample and read up on our expert writing tips to create your own social work resume that will have you landing interviews in no time! MSW with 5+ years of experience in serving the community, resolving conflicts, and providing guidance for those in need. Dedicated to training in domestic violence, adolescent and children needs. Experienced in crisis intervention and providing support in mental health. Social work is a field that requires a lot of hands-on experience with people in your community, hence it’s critical to demonstrate qualities such as active listening, emotional intelligence, critical thinking, and empathy. Follow the tips below to help you effectively showcase these abilities on your resume. When writing your resume it can be difficult to decide exactly how to start, especially for social workers who can have experience at various levels, including training, volunteer opportunities, and in a professional setting. Luckily, a Career Objective gives you a chance to emphasize your most impressive qualities and knowledge right off the bat. That way, hiring managers can instantly recognize what you bring to the table without having to scan through your entire application. MSW with 5+ years of experience in serving the community, resolving conflicts, and providing guidance for those in need. Dedicated to training in domestic violence, adolescent development, and children’s needs. Experienced in crisis intervention and providing support in mental health. If you’re not sure if a Career Objective is right for you, then take a look at our flowchart on how to start your resume. When you get to the professional experience section, make sure you consider the specific job description of the position you are applying for. A simple trick to addressing the needs of the employer is to use their job description as your guide. If you look close enough, you will find the target keywords that you should include in your professional experience. Pay attention to how the bullet point not only includes some of the key terms in the job description, but also uses an action verb (Facilitate) and quantifies their experience by adding the age range of their clients. If you can copy this method throughout your professional experience section, you will certainly make the hiring manager’s job easier. Use the list of action verbs below to make your bullet points more impactful. Need more verbs? Visit the longest list on the internet. According to the National Association of Social Workers, credentials are very important for building your social worker experience. Below you will find a comprehensive list of credentials available based on the area of your practice. Such credentials or specialty certifications can further validate social work knowledge and experiences gained previously. Keep in mind that to be qualified for these credentials and certifications, a BSW or MSW is required. Aside from degrees and certifications, clinical social workers are always licensed in every state. For most states, master’s level social workers are licensed regardless of whether they are in clinical practice or not. Social work licensure confirms that social workers have the appropriate education and training in order to provide competent services to the public. This helps protect the public so that issues and treatment are carried out in an ethical and effective manner by accredited professionals. Read more on the state-specific social work licensing requirements from HumanServcesEdu.org. If you will follow the tips above, you will be well on your way to crafting an impressive social worker resume. If you have a question about your specific situation, feel free to comment below. How should the wording be when you are currently sitting for the LMSW exam? You can include your LCSW license under the “Certifications” section on your resume.